Shalini is a Toronto lawyer who offers legal advice and support in the areas of tax, estate planning, real-estate and business. The options and solutions offered are based on a thorough consultation process and are tailored to your particular needs and situation. Shalini is a graduate of the School of Law at Queen Mary, University of London. She is also a post-graduate of the distinguished Masters in Taxation (MTax) Program at the University of Waterloo. 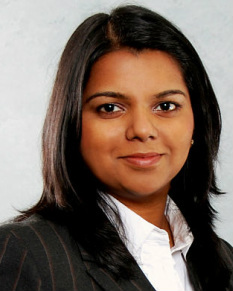 Prior to establishing an independent practice, Shalini worked with law firms in England and Toronto. Shalini has also served at the Canada Revenue Agency in the Large Corporate Files Appeals Division. She has worked extensively on Income Tax and Excise Tax Appeals by financial institutions and corporations. Shalini believes that in order to provide the best advice, it is essential to understand the clients' unique circumstances. As a trusted adviser, Shalini's clients include families that require the strictest privacy and confidentiality, regulated professionals, entrepreneurs, investors and private businesses. Her representative work includes negotiation of share transfer agreements, business sales, private lenders' representation, advising estate trustees, business and personal tax audits and voluntary disclosures. The Canadian Tax Foundation logo is a trademark owned by the Canadian Tax Foundation. Women's Law Association of Ontario logo is a trademark owned by Women's Law Association of Ontario.